The study of Islamist movements has often implicitly meant the study of Sunni Islamist movements. An enormous amount of political science scholarship has dissected the ideology, organization, and political strategy of Sunni Islamist movements.However these academic communities that study Sunni Islamism often proceed without any interaction with the academic communities that study Iran or Shi’a politics in Arab countries. 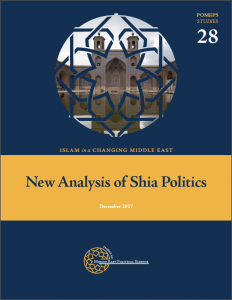 Studies of Iran and of Shi’a movements similarly often proceed in isolation from the literature on the Arab world or Sunni Islamist movements. This is unfortunate, because Sunni and Shi’a Islamist political dynamics engage many similar theoretical or intellectual issues and could offer each other critically important comparative perspective. Therefore, on October 13, 2017, POMEPS convened an interdisciplinary workshop of scholars of Shi’a politics to discuss these questions and to probe the similarities and differences between the two academic communities. We are delighted to publish this collection of essays resulting from that workshop. The essays range widely, both thematically and geographically, and together offer a deeply informed and often surprising portrait of political changes across very different contexts. They also reveal the profound methodological and intellectual divides between the academic communities studying Sunni and Shi’a Islamism. The essays in this collection range broadly over these issues and represent a starting point for the development of a research community. In the coming years, we hope to see much more attention paid to the comparative study of Sunni and Shia Islamism across diverse contexts. Bridging these linguistic, analytical, methodological and political divides would be an important step forward in the broader understanding of Islamist politics. Download the full collection here!